Fort Rucker is home to the U.S. Army Aviation Center of Excellence. The training and education of over 23,000 Army Aviation Soldiers and leaders happen on this base annually. Fort Rucker has a huge impact on the economy in Southeast Alabama and throughout Southwest Georgia and Northwest Florida. It is the fifth largest employer in Alabama and boasts a population of close to 20,000 people to include civilians, soldiers and their families during the day. It is also the largest employer south of Montgomery with a $1.5+ Billion annual economical impact. This installation supports over 130,000 retirees and veterans within the tri-state area. Those who are stationed at Fort Rucker as well as those who work on base, purchase goods and services from Daleville, Enterprise, Ozark, Dothan and the surrounding areas. For newly stationed soldiers and their families, many are not familiar with restaurants, retails shops and services offered throughout the Wiregrass. Durden Outdoor offers an exclusive opportunity to build your brand identity with those stationed and working at Fort Rucker by reaching them first. We have Bulletins, Digital and Rotary Posters located at Fort Rucker’s three Gates starting at just $15.00 per day. Targeting this specific audience will give your business the potential to expand your customer base and increase your revenue. 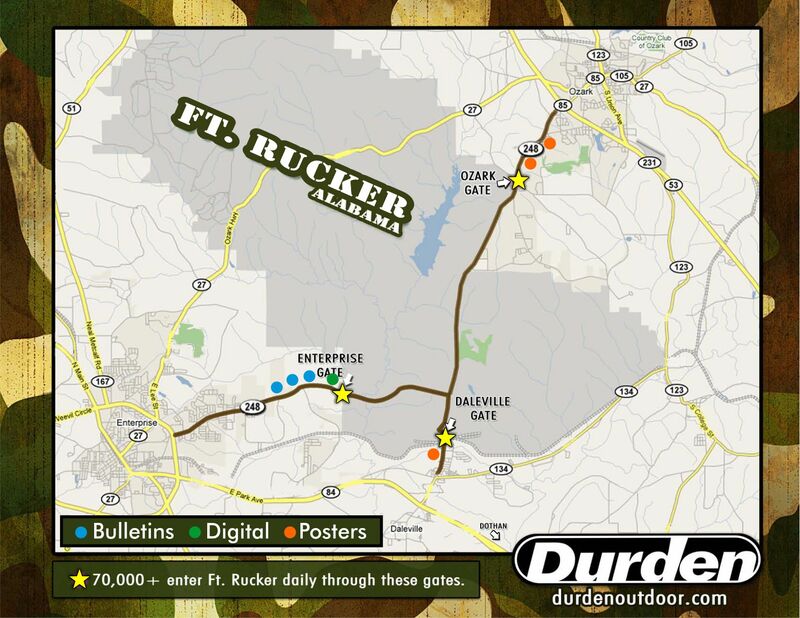 Contact a #FAMOUSMaker today at 334-792-5056 or sales@durdenoutdoor.com to learn more about reaching Fort Rucker.